I'm making a plugin for Monopoly for Millennials. 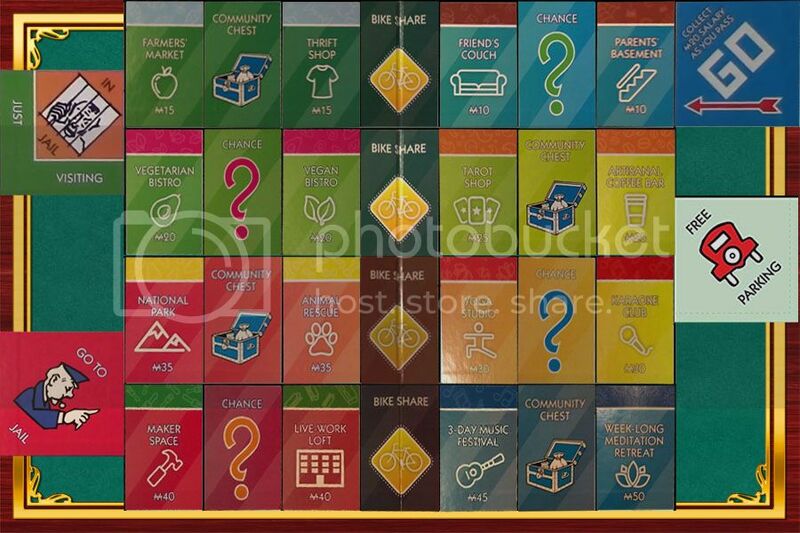 Because Monopoly games always have the big useless area in the middle of the board, doing a proper background with the board would result in everything being smaller. So I decided to modify the layout and have the movement be serpentine... starting with "GO" in the upper right, moving left, then down and around to the right and back and forth. This allows all spaces to be right-side-up, and also bigger, allowing the spaces to be more readable. Any thoughts on this layout? What would you think of playing it like this? The below board image is still a work in progress, but is mostly done. I don't actually own the game... I used video stills of an unboxing of this game. All the spaces are in proper order when going in the direction as I described. I had to do 2 rows in backwards order to accomplish that. Noting that this is an old request, I find it hard to follow, but I am neither a millennial nor have I played that version of Monopoly. I think the idea basically works, but it would be a lot clearer with some graphical element helping your eye navigate the switchbacks. Maybe something like this? Okay so I might have gotten a little carried away here, but I think a border also really helps you know which way to go. It was bugging me that it was off-center. I also made the levels a little more consistent.